This week’s federal Ipsos poll for the Fairfax papers, conducted September 12-15 from a sample of 1,200, gave Labor a 53-47 lead, a two-point gain for the Coalition since mid-August. Primary votes were 34% Coalition (up one), 31% Labor (down four), 15% Greens (up two), 7% One Nation (steady) and 13% for all Others (up two). The respondent allocated preference figure was also 53-47 to Labor. Newspoll and Essential last week respectively gave Labor 42% and 37% of the primary vote, with the Greens at 10% in both polls. At the 2016 election, Ipsos consistently had the Greens higher than other polls, and the election results were in line with the other polls, not Ipsos. Ipsos is the only Australian pollster that still uses live phone interviews (mobile and landline) for its polls. All other pollsters now use either robopolling, online methods, or a combination of the two. However, live phone polling cannot be the only explanation for the high Greens vote, as Newspoll and Ipsos’ predecessor in Fairfax, Nielsen, once used live phone polling without a persistently high Greens’ vote. While Ipsos’ primary votes are weird, the two party vote is more volatile than other pollsters, but it usually tracks other polling well. There may have been a decline for Labor because voters are no longer focused on the chaotic events leading to Malcolm Turnbull’s ousting as PM. The last Ipsos poll (55-45 to Labor) was released on August 20, and four days later, Turnbull was gone. While this poll was not the reason for Turnbull’s downfall, it may have been the “straw that broke the camel’s back”. Two ReachTEL polls taken in the week of Turnbull’s ousting gave Labor a 51-49 and a 53-47 lead, so the 55-45 Ipsos lead was probably an outlier. Scott Morrison debuted in Ipsos with a 46% approve, 36% disapprove rating, for a net approval of +10. The August Ipsos gave Turnbull a net -2 approval, but the July poll gave him a net +17 approval. Shorten’s net approval rose seven points to -4. Morrison led Shorten by 47-37 as better PM (48-36 to Turnbull in August). We now know that Dave Sharma is the Liberal candidate for the October 20 Wentworth byelection, and that former AMA President Kerryn Phelps will stand as an independent. A ReachTEL poll conducted August 27 correctly listed Sharma as the Liberal candidate, and asked for two prominent independents, Phelps and Alex Greenwich; Greenwich is not running. The results in this ReachTEL poll were 34.6% for the Liberals’ Sharma, 20.3% for Labor’s Tim Murray, 11.8% for Phelps, 11.2% for Greenwich, 8.9% Greens and 13.3% for all Others. This poll was taken on the Monday after Turnbull was ousted, and the Coalition’s polling could improve by the byelection date. Sharma could also lift his profile before the byelection. The Victorian election will be held on November 24. A state Galaxy poll for the bus industry gave Labor a 53-47 lead, a two-point gain for Labor since an early August Galaxy for The Herald Sun. No fieldwork dates, sample size or primary votes have been released yet. 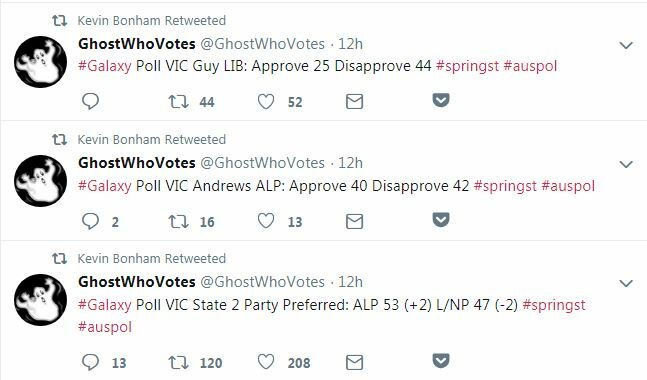 Going back to April, there have been three successive Victorian polls with Labor just ahead by 51-49 from Newspoll, ReachTEL and Galaxy. It is likely Labor’s larger lead in this poll was due to a backlash over the dumping of Turnbull. On my personal website, an analysis suggested that the Coalition under Morrison was vulnerable among the well-educated, the young and in Victoria. 40% approved of Premier Daniel Andrews and 42% disapproved for a net approval of -2. Just 25% approved of Opposition Leader Matthew Guy and 44% disapproved for a net approval of -19. In July I wrote that, unless legislation to abolish the group voting ticket system for the Victorian upper house passed both chambers by September 20, group voting would be used at the state election. With just three days until the final sitting date of parliament before the election, there is no proposal for upper house reform. It is very disappointing that a left-of-centre government has not even attempted to improve the upper house voting system. As I reported last week, a byelection in the NSW state seat of Wagga Wagga was held on September 8. The Liberals held Wagga Wagga continuously since 1957. Primary votes were 25.5% Liberal (down 28.3% since the 2015 election), 25.4% for independent Joe McGirr, 23.7% Labor (down 4.4%), 10.6% for independent Paul Funnell (up 0.9%) and 9.9% Shooters. After preferences, McGirr defeated the Liberals by 59.6-40.4, a 22.5% swing against the Liberals. 47% of preferences from the other candidates flowed to McGirr, 15% to the Liberals and the rest exhausted under NSW’s optional preferential voting. In the FiveThirtyEight poll aggregate, Donald Trump’s approval rating has fallen from about 42% in late August to 40% now. Trump’s ratings are their lowest since February. I wrote a detailed analysis on the November 6 US midterm elections for The Poll Bludger on Saturday. Trump’s ratings are highly correlated with Republican performance in the race for Congress, so worse ratings for Trump will result in larger Democratic leads in the race for Congress.